Barisal University Admission Result 2019. Barisal University Honors Admission Notice 2018-2019. The authority has been publish honors first year admission notice. Admission test notice will be publish soon. Barisal University honors first year admission notice 2018-2019 session will be publish soon. 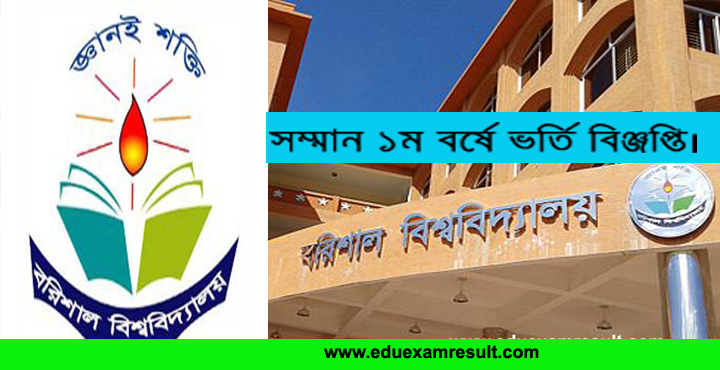 You can also found here Barisal University KA unit admission test result and notice. KHA Unit, GA unit and GHA unit admission test result and notice also found here. Admission test date and time. We are also publish admission test seat plan and merit list result. Barisal University is one of the famous public university in our country. Every year they are publish a admission notice for honors first year students. In this year they are also publish this admission notice in the month of August or September. In the past the notice was publish in second week of September. So, we are expected that this year also publish admission notice in the same time. You can found here all kinds of information about this admission. www.barisaluniv.edu.bd. Barisal University Admission Result Notice. If you are a candidates of GSE and passed O-Level exam in 2012 or after that with minimum 5 subject and Passed the A-Level exam in 2015/2016 then you can apply. Total seven subject in O-Level and A-Level minimum obtain B Grade in 4 subject and C grade in other 3 subjects. If you are study in any foreign country then you must be showed their requirement document. Application Process: If you want to apply for honors admission then click apply now link. You can also apply from their site. You will be found a application link on their website. Application process only SMS base. So, if you want apply then you must be have a teletalk SIM. Application Fee is 550 Taka. So, you must be have sufficient balance in your account. If you have sufficient balance then apply now. Go to your write massage option on your phone. Simply type in the following instruction. Fist SMS: BU<space>HSC Board Name (1st 3 Letter)<space>HSC Roll<space>HSC passing Year<space>SSC Boar Name<Space>SSC Roll <space>SSC passing Year<space>Unit Name and send it 16222. Example: BU DHA 234636 2016 COM 273634 2014 KA and send it 16222. If you are a quota candidates then type. BU DHA 234636 2016 COM 273634 2014 KA FFQ and send it 16222. If you have more than quota then follow this format. BU DHA 234636 2016 COM 273634 2014 KA FFQ,TQ,OTH and send it 16222. After successfully completed your application you will received a SMS. The are provide a PIN Number and Form Number. Save all the SMS carefully. Because the information are required when download your admit card. Thy are announced admit card download date and time. You can also download your admit card from our site. At first scan your passport size colour photo on your desktop. Photo size is 300*300 pixel and file size not more then 100 KB. Signature size is 300*80 pixel and not more than 60 KB. Click Admit Card Download Link. Put your user ID and password and log in. Upload your photo and signature in right size and format. After successful uploaded your photo you will be able download your admit card. Download two copy admit card and print it. You must be attached two copy attested passport size color photo in your admit card. Unit name, applicant name, roll number are write on your admit card. Exam date and time will be inform in their website. If you are face any problem then inform them. You can also visit their website. Finally you are able to attend admission test. If you are obtain good marks in admission test then you are able to admit. You can also download your result from our site. Quota key word, Unit key word and board key word you can found in the circular. We are finally upload more information in time. So visit our site regularly.